Mangarh is a small village nestled amid the lush green farmlands of Pratapgarh District between Ayodhya and Prayag (Allahabad), U.P. Jagadguru Shree Kripaluji Maharaj, Shree Maharajji, appeared in this holy land in 1922 on the full moon night of Sharad Poornima. In order to benefit the deserving souls desiring God’s love, Shree Maharajji founded the ashram at Mangarh Dham in 1966. Because of the overflowing Grace of Shree Maharajji, this once unknown and quiet village has been attracting the faithful ever since. As the name suggests this is home (dham) of devotion (bhakti). The ashram has steadily expanded and, in recent years, has grown to accommodate thousands of devotees who come to experience the extraordinary devotional atmosphere. To meet this growing enthusiasm, the original satsang hall was replaced in 1996 by a larger hall. That growth has continued, and in 2012 an even larger hall Bhakti Bhavan was inaugurated for the unprecedented numbers of devotees who flock to Mangarh Dham. The ashram also contains numerous guest rooms, a large kitchen and dining hall, gardens, orchards and a goshala. Shree Maharajji used to hold Spring Sadhana Program, which culminates in the joyous Holi celebration, and the annual month-long Sadhana Program held in October. Both programs attract thousands of devotees from around the world, who come to deepen their knowledge of devotion and God and practically experience the sweetness of Raganuga Bhakti, as taught by Shree Maharajji. 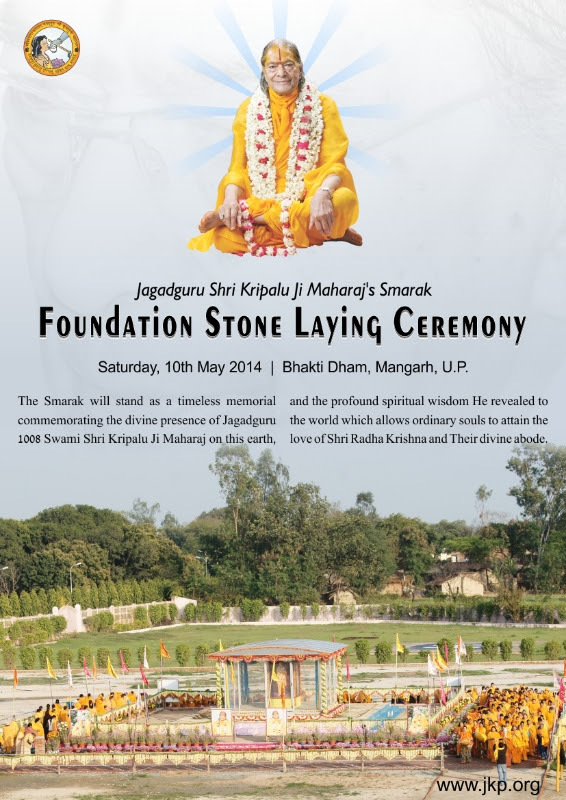 JKP Bhakti Dham is also home to the Divine monument Bhakti Mandir and the Jagadguru Kripalu Charitable Hospital. Shri Maharajji brought his visible divine leelas to a close on 15th Nov 2013. His divine remains were consigned to fire in front of Bhakti Mandir. In the same place a memorial is being built.